Spanish is clearly the predominant LEP language spoken in the region and there are 33 stations where the nearby Spanish LEP population served is 5 percent of total households or more. One interesting finding from the latest data is that the long-standing Chinese LEP population in the Chinatown area is shrinking, while the Chinese population near Rockville is growing. 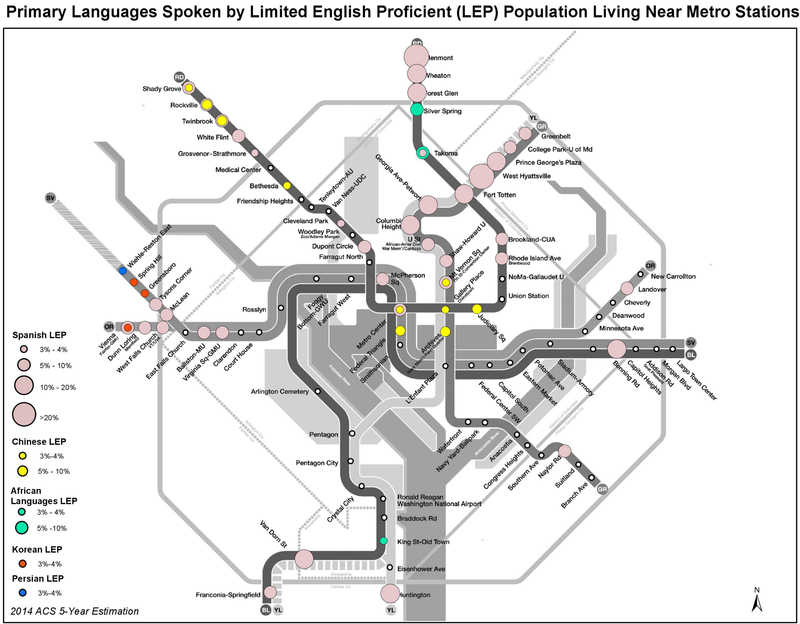 Also noteworthy is a significant African LEP population near Silver Spring Station, with African languages such as Amharic spoken in this area. In addition to Spanish, Chinese and African Languages, we also see Korean and Persian languages as nearly reaching the 5 percent translation threshold and clearly exceeding the 1,000 speaker threshold. In the Metro service area, 11.4 percent of the population speaks a language other than English at home and speaks English less than “very well” – and are therefore considered LEP. There are 26 non-native English language groups with a LEP population above 1,000. Of these languages spoken in the region, the table shows top 13 languages with more than 5,000 LEP persons. The regional map below shows the distribution of these top 13 languages at the census tract level where the LEP population exceeds either the 5% or 1,000 speaker threshold. Since the non-Spanish LEP population is aggregated into larger groupings (Indo-European, Asia-Pacific and Others), we joined the tract based LEP data with the specific language data to identify the specific languages within the tracts. 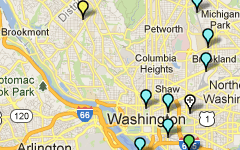 One colored dot represents one LEP household. The Indo-European language group is shown in a range of blue color, and Asia-Pacific is colored from yellow to red. Overall, the language data correlates well with some ethnicities and shows a similar pattern of population distribution. What patterns do you see in these maps? Do any of these population groups surprise you? Another good argument for updating the fare vending machines so that they can “speak” in multiple languages. This is pretty common at transit systems around the country. This is great information that I am using for a report. What year of census data was used. My guess it that it was 2015 census data, but would like to confirm.